While I'm certainly not passed the point of receiving advice myself (although I guess no one really is) I feel that I have had my share of trials and errors in filmmaking or video-making. From a kid who wanted to make movies, to a film student who wanted to get out of class, to an adult just looking for film work, it continues to be an uphill battle. 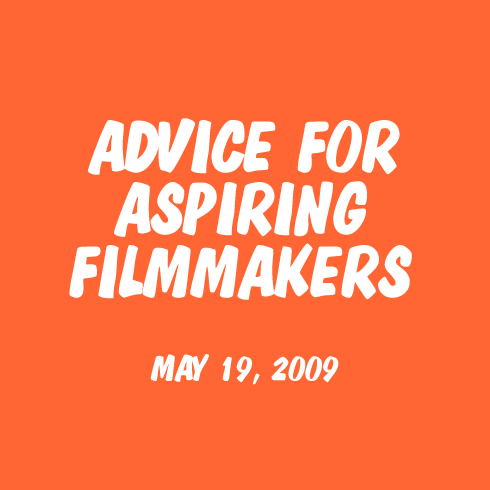 There's certainly no correct formula to success, but if you're looking for a few tips on what you can do to improve your own creative ambitions, maybe take filmmaking beyond a hobby, here are a few things that have helped me out. Whether you're a film student or not, I've met my share of people who thought they already had it all figured out. There's never a shortage of techniques, concepts, styles, etc. to pick up on. The more willing you are to learn, the more experience you naturally open yourself up to. You don't have to like everything, but try and experience it at least once. The more varied and dynamic your approach, the more credibility you gain when speaking with other artists, and the more likely you are to refine your own tastes. Eventually you're going to encounter someone who will rant about how all Hollywood flicks are awful - formulaic, boring, repetitive, etc. Don't shy away from the debate, but don't feel guilty about stocking your own DVD collection with comedies. The world needs entertainment, and not everything has to be high art. Eventually you're going to encounter someone who will rant about how experimental films are cliche, without purpose and overly pompous, and how the only films worth seeing are the ones with A list stars and directors. Again, don't shy away from the debate, but remember to continually test yourself with a wealth of movies outside of the weekends top box office. 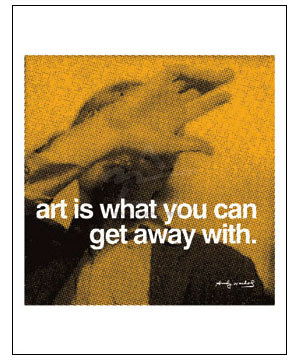 You'd be surprised how often the avant-garde inspires what later becomes the mainstream. Remember, the world needs art and experimentation, and merging creative substance with accessibility speaks to every quality film made. If you wanted to be a writer, you'd be told to write. If you wanted to be photographer, you'd be told to take pictures. Same goes for filmmaking: if you want to make movies (whatever facet of the industry you're interested in) practice doing it. Your greatest lessons will come from your own mistakes and successes, and trust me there will be a lot of them . . . mistakes that is. It always looks easier than it actually is, but your own push to see what you can do will pay off as you continue to improve. You most likely won't start off with the best equipment, but use that as part of the challenge. Sometimes limitations help to establish borders which makes it easier to work. The more you create, the more you learn. Filmmaking at its core is about experiences used to tell a story. Keep this in mind when watching other films, television and the random events in your own daily life. The more you pay attention to, the more material you'll have for your own concepts. So don't expect to! One of your biggest challenges is going to be finding a style and approach that you're comfortable with; One that makes you confident enough to shake the 'you should'ves' and 'I don't get its' that all filmmakers inevitably hear. You have to take pride, first and foremost, in what your producing. If you've already acknowledged your projects flaws and decided to work on them, you may not have a project that everyone likes, but you will have one that meets your own standards - people who do like your work will respect that. And remember, opening yourself up to raw feedback will naturally lead to your ability to receive it and give it - not to mention, it'll thicken your skin. For an independent filmmaker the Internet is the best tool out there. It's a no-brainer. Use it to upload your work to various sites, create a blog to share it, network with people from around the world, research film terms, theory and history, look up festivals and competitions, get feedback from strangers, etc. etc. Undoubtedly, you're going to question a lot of things from what type of equipment to use, to film school, to possible jobs, and so on. The beauty of a film career is that there are thousands of different ways to get to the same destination. Search out the info that helps to back up your approach. This may sound pointless, but don't underestimate the benefit of someone else's experience and the motivation you can get from a little positive reinforcement. There's nothing like a group of peers to share with, debate with, and draw from. By looking out for the interests of others, you'll have more people looking out for yours. It's a social business, and knowing the right people counts. Also, don't be afraid to promote yourself. It's obviously what I'm doing with this blog. All my online sources link back here, so if anyone wants to search me out it's as easy as typing my name - Luke Fandrich - into Google. The success won't be apparent overnight, but I've been asked to screen my work at different festivals just for the fact that people saw my work and could easily get in touch with me - the online portfolio also speaks to professionalism. With any bit of persistence you're bound to find a job related to the field you'd like to work in. Even if you're just a production assistant it still gets you behind the scenes, and you'll still meet a lot of people. For me, I got my first post-university job because of the work I had submitted to the Medicine Hat Film Festival, where it was the company running the festival that remembered my work and hired me. I'm still currently working as a corporate videographer and editor, which is a great practical start to whatever I move onto next. This all ties back into gaining experience. Whether you like it or not, you can't do everything by yourself. Find a related or semi-related job to broaden your prospects and to get into the field that you really want. The most general and vague advice I could probably give is also the most important. There are going to be times when you feel like no one is paying attention, that what you're doing doesn't matter, and that's it just easier to give up. Remind yourself on a regular basis of what it is you're working towards, and what it is you've accomplished. It's like pulling a heavy wagon up a hill. You may not be able to see the top, but just by keeping at it you naturally work your way higher. If you stop, you'll just slide backwards and have to make up the ground again later. Hard work talks, persistence talks, passion talks, sitting back and hoping only wastes your time. Working through the tough times not only says that you're serious, it helps prove to yourself how much you want to succeed. Enjoy your experiences, embrace challenges, find ways to motivate yourself, and learn with an open mind. Those who are persistent end up reaping the rewards. The most sound advice I have for aspiring filmmakers is the one thing that I can actually guarantee; Keep at it and you'll find your niche. The story always seems to be the same... Dedication, hard work, sticking it out, and meeting people along the way. True. There are a lot of variables in how one goes about things, but ultimately you have to work hard. I think a common misconception is that luck just happens, where in reality luck is the result of your hard work putting you in the right place at the right time.